The InfoSWMM and InfoSWMM SA drawing area displays the actual network schematic. You may use a combination of InfoSWMM and ArcMap commands to create, modify, edit and maintain your InfoSWMM and InfoSWMM SA projects. You may bring in Base maps and/or other external drawings into InfoSWMM and InfoSWMM SA and use it to create your collection system. Any of the InfoSWMM InfoSWMM SA elements such as Raingage, Subcatchment, Junction, Outfall, Divider, Storage Unit, Conduit, Pump, Orifice, Weir, and Outlet may be created in the drawing area using the InfoSWMM InfoSWMM SA tools/commands. Attribute data may be associated with each of the elements in this drawing. These values will be stored in the InfoSWMM and InfoSWMM SA database and may be edited at any time. Each element has a different symbol to identify them with. The InfoSWMM drawing area displays the actual network schematic. 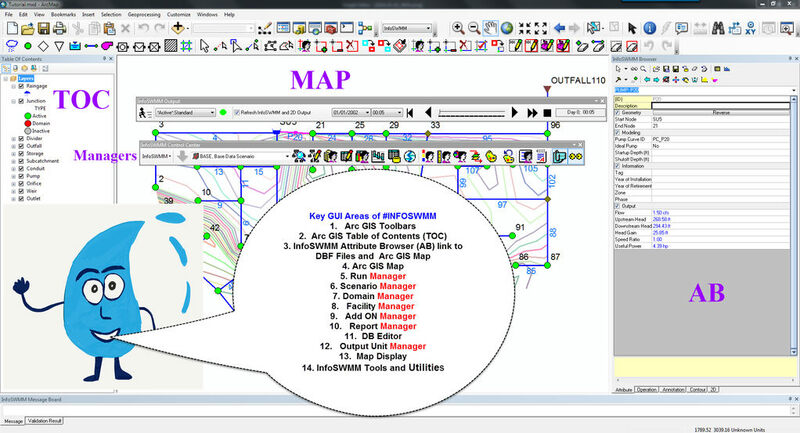 You may use a combination of InfoSWMM and ArcMap commands to create, modify, edit and maintain your InfoSWMM projects. You may bring in Base maps and/or other external drawings into ArcMap and use it to create your collection system. Any of the InfoSWMM elements such as pipes, pumps, wetwells and manholes may be created in the drawing area using the InfoSWMM Create menu commands. Data may be associated with each of the elements in this drawing. These values will be stored in the InfoSWMM database and may be edited at any time. Each element has a different symbol to identify them with. For any of the different available InfoSWMM commands refer the InfoSWMM help file.